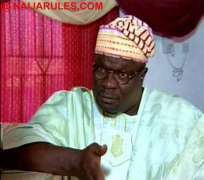 Today is Don jazzy's Birthday so is renowned veteran actor, Olumide Bakare clocks 60 today, 26th, November 2013. The energetic actor has been receiving a lot of congratulatory messages from friends,family members, colleagues as well as well-wishers through their various social media accounts, am sure he must be very happy that he is loved. Happy birthday, celebrate on a high note. Limpopo Kcee Goes Back To Old Love, Ebube Nwagbo After Marriage Breakdown?